In May 2000 Chris Smith left his comfortable Worcestershire home, but instead of cycling the routine twelve miles to work, he kept on pedalling. Thirteen months later (having fallen off six times and worn out three sets of tyres, three chains and two pairs of boots) he arrived in Beijing. During a gruelling 16,500-mile examination of physical and mental stamina he traversed scorching deserts, scaled lofty peaks, crossed mighty rivers and risked extinction in the chaotic traffic of the cities. He ate and drank in roadside cafés in the company of inquisitive lorry drivers and shared dormitories with farm hands and mosquitoes in remote Chinese villages. He survived bugs, blizzards, cockroaches, heat, hurricanes, sandstorms, cyclones, stone-throwing locals and lunatic drivers. Sceptical western existentialism encountered religious fatalism in the cafés and teahouses of the Middle East and India during a physical and spiritual journey that constantly raised questions about attitudes and values widely taken for granted in the West. 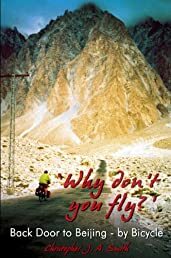 ‘Why Don’t You Fly?’ is the account of an epic quest to rediscover a misplaced sense of identity in which exhilaration and exhaustion trade positions against a backdrop of prodigious physical endeavour.